I love making split pea soup. It’s got to be the ultimate comfort food. For me, as a dutch oven cook, it’s especially cool because I usually do it the day or the week after I made a big, huge, delicious bone-in ham. The bone usually still has a lot of meat attached to it, and that meat and the bone is steeped in the spices and flavorings that I used on the ham. So, each time I make the soup, it’s completely unique. As I mentioned before, this time, Brendon had the brilliant idea of putting the soup in the bread boules I was making that morning. You could use just about any bread flavor, but this time, the Italian bread was perfect. It’s got a little sweet from the sugar, but not very much. 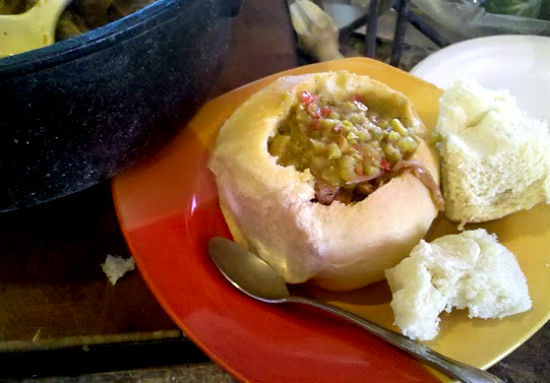 Most of the flavor is from the flour itself, added to the savory tang of the ham and the split pea soup. Amazing! I used the same soup recipe I always use, which you can find here. The end result is a delicious, rich, and even elegant meal.